4.2 out of 5 based on 31 bloggers and 12 commenters. 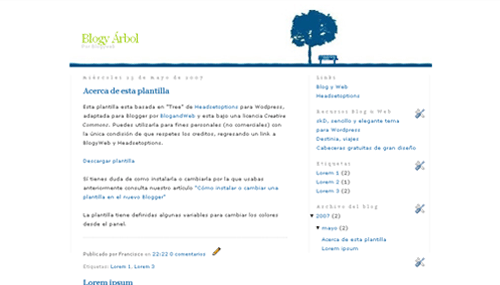 Árbol is a free blogger template adapted from WordPress with 2 columns, right sidebar, minimalist and neutral colors. the link for download is not working. how can i get the codes for installation? can you please email me the instruction. i uploaded the template and it looked great. soon, the header image disappeared. i have re-uploaded the template again, to no avail. all of the other elements are there, just no the tree/bench element. i had a similar problem with another template and i don’t know what to do. i would appreciate some help. thanks! i am now using this template. got to love it. but the items on the side bar seems to be grouped at the bottom at the page. only 1 sidebar item is displayed at the top, other will be displayed at the end of the last post on the page. how can i fix it? thanks so much for the fix!! the link for download is not working. can i get the codes for installation? please email me the instruction. I’m using this template but I can’t see the second column while using mozilla. With explorer I can. What is happening? Beautiful template, have always loved this one… Thank you, and thanks for the fix..